August 14, 2008 / montanaron / Comments Off on Update-Friday 9:00 a.m.
Nai and I took a tuk-tuk to his village yesterday. 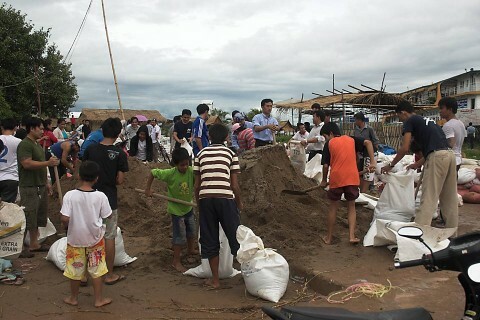 As expected, the Mekong was spilling over its banks for most of the way that it neared the road and sandbagging was active in the area around the capital. However, no such activity was occurring in his village, and, again as expected, his family compound was under water. The narrow dirt road running past the houses was just a bit less than knee-deep with water, but the housing area drops off a bit from the road and the water was waist-deep there. Of the 6 houses, two were under water, but they were temporary quarters, made up of plywood and tin siding. The other 4 “real” houses are still habitable, due to their having a second floor or the first (and only) floor being built a bit higher on its concrete base. 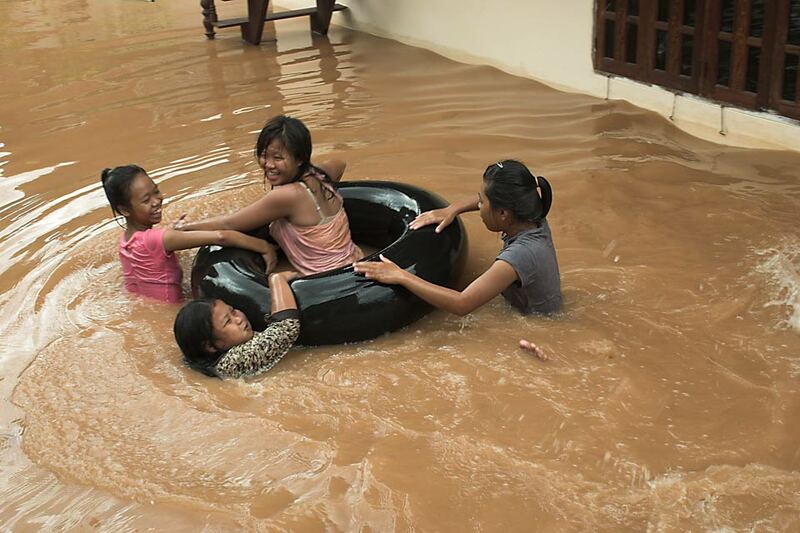 For the kids, the area is one big swimming pool, and they were frolicking in the water as I waded to one of the houses, which belongs to Nai’s sister and her husband and two young children. The adults seemed to be looking at the flood as a slight inconvenience more than anything else, and life continues as before. The major effect is that their croplands are under water and those who depend on farming for their livelihood are in a bad situation. Some of the family work outside the farm, so all is not desperation. Still, I gave them a bit of money for food and water and will give them some more when we go back to visit on Sunday, the birthday of one of the kids–Kim, 6 years old. After Sunday, I’m going to Nong Khai for a day, then will take the overnighter to Bangkok, staying there until flying on to Korea next Sunday. Hopefully, Bangkok’s annual flooding will not take place early this year. More later. 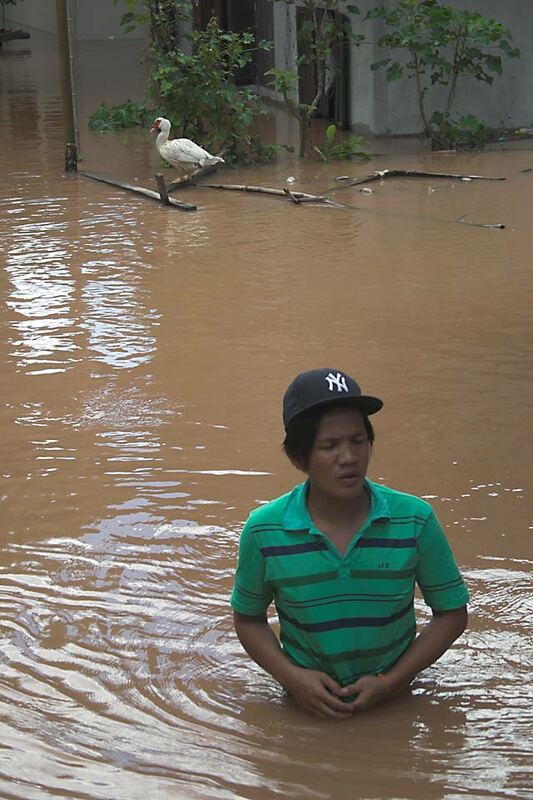 Here’s Nai taking a walk in the floodwaters at his house. Some of the kids having fun. 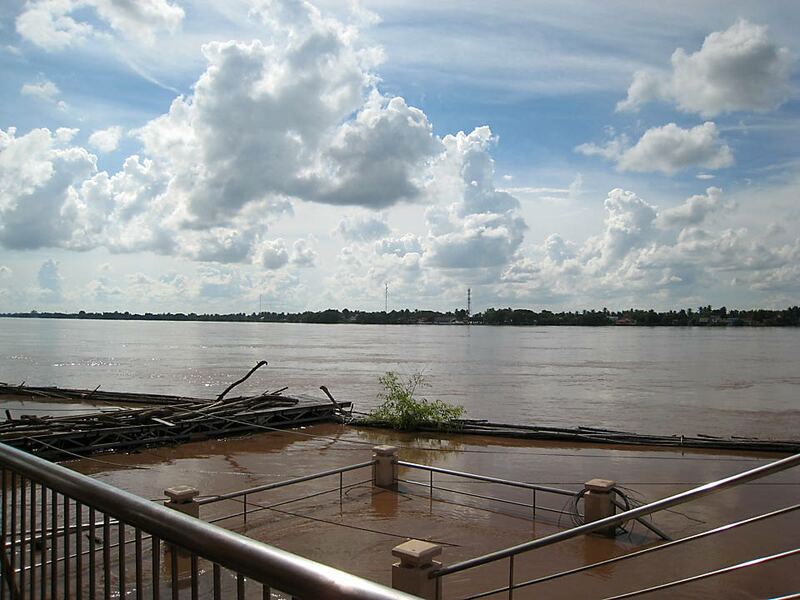 And here’s the flood from the Nongkhai side. This jetty/pier extends down a good 7 or 8 more feet, but it was underwater then.